Is Caffeine Bad for Your IBD? A stimulant found in many different foods and beverages, caffeine affects the body in several ways. Most people know that caffeine is found in coffee, tea, and cola drinks, but it can also be present in chocolate, coffee-flavored ice cream or frozen yogurt, energy drinks, and some medications (over-the-counter painkillers in particular). As many as 80 percent of adults in the United States consume caffeine on a daily basis. In the rest of the world, the percentage of people who use caffeine jumps to 90 percent. People with inflammatory bowel disease (IBD) are caffeine users as well, but the question remains as to whether caffeine consumption is safe for people living with a chronic digestive disease. Caffeine does have certain effects on health, but the method of delivery is also important. The food or drink containing the caffeine can have a big impact on the symptoms of IBD. As with most things related to diet, moderation is key, and caffeine consumption is no different. Caffeine tends to be seen in a positive light, because it can heighten alertness, which in turn may translate to better performance at work or school. Caffeine can also stimulate metabolism and reduce anxiety in some people. However, there can also be negative effects, such as a decrease in the quality of sleep. Sleep is extremely important for people with IBD, and care should be taken to lessen the potential for caffeine to cause sleep disturbances. When it comes to the gastrointestinal system, however, caffeine-containing foods and beverages could be problematic. Coffee, in particular, which may contain anywhere between 80 and 130 mg of caffeine, has been associated with gastroesophageal reflux disease (GERD). Some people drink coffee in the morning in order to be able to move their bowels. It's commonly thought that it is the caffeine that stimulates the bowels, but more likely it is also due to the other chemicals found in coffee. The evidence seems to support the idea that coffee can stimulate the colon, even decaffeinated coffee (although the effects are somewhat decreased). For people with IBD, moving the bowels more frequently may be problematic, especially if chronic diarrhea is already a problem. Children with IBD are at risk for several complications, especially from lack of nutrients and from malnutrition. Caffeine can suppress the appetite, and in children with IBD who may already suffer from a lack of appetite, caffeine could compound the problem. Children and adults with IBD who are underweight should take care to ensure that they are not suppressing their appetite unduly because getting enough calories every day is crucial to maintaining weight. Caffeine is a diuretic: it causes a person to urinate more. It's not clear if this effect can contribute to dehydration. However, the loss of fluid could cause stools to become harder, making them more difficult to pass. Anyone who tends towards constipation will want to make sure that they are drinking enough water to compensate. Caffeine's effects on the body are highest about an hour after it's ingested. Caffeine isn't stored by the body and is eventually excreted in urine, but it can continue to have effects that last four to six hours. Eating or drinking caffeine within a few hours of bedtime could cause a disruption in sleep. People with IBD are already at risk for problems with sleep, especially if waking in the night to use the bathroom. Many people forget that caffeine is itself a drug, and can, therefore, interact with prescription and over-the-counter medications. Some of the drugs that can interact with caffeine include antibiotics, Tagamet (cimetidine), anticoagulants, and monoamine oxidase inhibitors (MAOIs). Patients with IBD should talk to their doctors about their caffeine use and how it may interact with any medications. In America, caffeine consumption is something of a ritual. About half of Americans drink coffee in the morning. Caffeine is bitter and is therefore often disguised with one of a dizzying array of sweeteners or additives, everything from sugar and milk to honey or aspartame. While some have their morning caffeine at home, from increasingly sophisticated home brewers, others head to one of the many coffee houses or fast-food restaurants that serve caffeinated drinks. Coffee and tea are also commonly served after dinner with dessert, or in the mid-afternoon to combat fatigue. 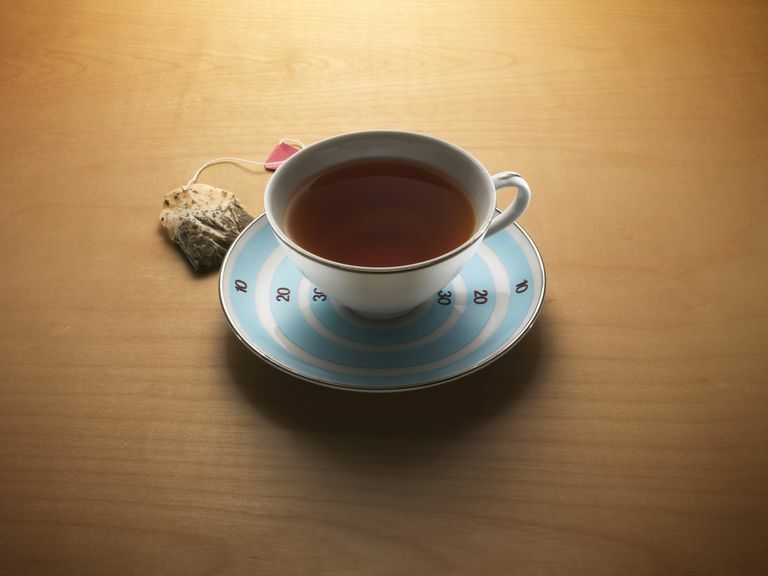 Coffee and tea drinkers bond over their caffeine dependence, often making light of it. However, caffeine dependence can be a serious problem, and breaking the cycle of caffeine use is difficult. While most people take their caffeine use lightly, it is actually a topic that should be carefully considered. People with IBD may experience both positive and negative effects of caffeine use. How much caffeine is being consumed every day should be discussed with a gastroenterologist, in order to assess the potential for medication interactions and other potential complications. Boekema PJ, Samsom M, van Berge Henegouwen GP, Smout AJ. "Coffee and gastrointestinal function: facts and fiction. A review." Scand J Gastroenterol Suppl 1999;230:35-9..
Food And Drug Administration. "Medicines in my Home: Caffeine and Your Body." FDA.gov Sept 2007. MedlinePlus. "Caffeine In The Diet." National Institutes of Health. 5 May 2011. Rao SS, Welcher K, Zimmerman B, Stumbo P. "Is coffee a colonic stimulant?" Eur J Gastroenterol Hepatol 1998 Feb;10:113-118.